There is no one way to make a quilt. There are lots of techniques. 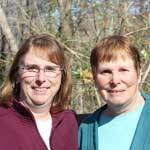 Learn basic quilting information such a fabric preparing, cutting the fabric including use of rotary cutter, pinning, pressing and more quilting basics. 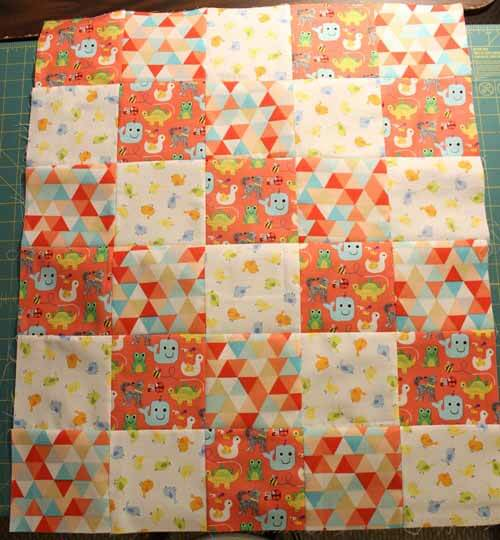 Learn how to make a quilt using 5 inch blocks. This quilt is a crib or baby sized quilt which is a great size to make for a first quilt and this one is simple to make. 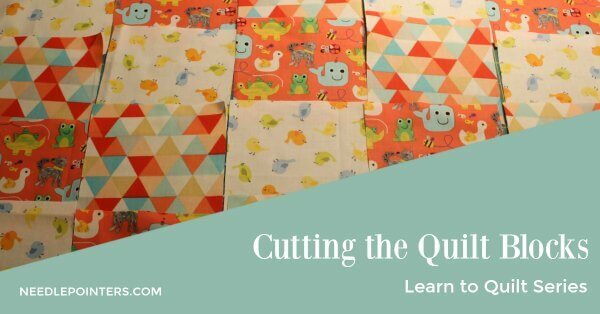 A series of YouTube tutorials and written instruction will teach you how to cut the block, assemble the blocks, make a backing, layer and pin baste, quilt the top and bind the quilt. Do you have trouble choosing quilt colors? Learn how to choose color schemes for a quilt. Cutting the fabric for a quilt is one of the most crucial steps. Accuracy is a must. Learn how to prepare and cut fabric. Before rotary cutters and special measuring tools were invented, quilters used a lot of plastic templates to cut quilt pieces. Even today, to make certain patterns, such as applique or pattern from magazine, a plastic template is necessary. Learn how to transfer pattern shapes to template plastic. Piecing Techniques! How to hand piece? How to machine piece? Curved piecing? Triangle piecing? English piecing? Paper piecing? Learn all these techniques for assembling blocks. 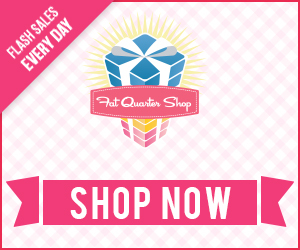 Quilters Press, They Do Not Iron! A very important aspect of quiltmaking is pressing - pressing fabric, pressing seam allowances, pressing blocks, pressing sashing. After assembling the quilt blocks, it is time to sew the blocks together to make the whole quilt top. Learn how to assemble the quilt top. How to choose a batting for a quilt? What are the types of batting? How to join scrap pieces of quilt batting together. Batting facts? Learn how to choose the right batting for the quilt. What is a quilt sandwich? A quilt sandwich is the process of assembling three layers of the quilt together - the quilt top, the batting and the backing. This needs to be done carefully. Learn how here. Quilt backing is the fabric on the back of the quilt. Sometimes it is necessary to piece fabric together to make a quilt backing. Learn ways of piecing the fabric together to make the quilt backing. Need ideas for quilting a quilt top? Try quilt motifs. Quilt motifs are quilting designs you can use to quilt the quilt top. Want to learn how to hand quilt? Hand quilting adds heirloom vintage look to the quilt. Learn how to hand quilt. Learn how to machine quilt a quilt top. How to finish a quilt by tying it. Learn how to make binding, how to sew binding on a quilt, how to miter corners and other quilt edgings. An essential part of finishing a quilt is to attach a label. No quilt is complete without one. There are different types of quilt labels. Learn all about quilt labels here. Quilt embellishments is a fun way to add personality and texture to a quilt. Learn some interesting concepts.